I’d like to preface this review with a little back-story. 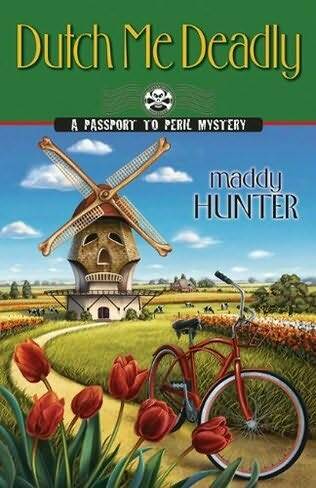 I discovered the Passport to Peril series several years ago, loved it, and read all the books very quickly. I was so sad when the series ended, because it felt like saying goodbye to old friends. A few months ago, I was writing a post about top 10 books/series more people should know about, and I wanted to include the Passport to Peril series. When I went to look up the order of the series, I was amazed and excited to see that a new book had been added to the list - I was thrilled that I’d get to see Emily and Nana and the gang again! I immediately looked to see if Maddy had a Facebook page, and she did, so we got to chatting, and she told me that a new publisher had wanted her to continue with the series, thus Dutch Me Deadly was born. I mentioned that I was a book blogger and that if she happened to need reviewers, I’d be thrilled to get an ARC (so subtle I know, but you don’t understand how much I love this series! ), so she had her publisher send me a copy! Thank you so much Maddy and Midnight Ink! The gang has reunited, as amazing as ever! I had really missed these characters, along with Maddy’s quick wit and seemingly effortless writing style. After waiting so long to rejoin the Iowa gang, I wasn’t disappointed. The seniors are as funny as ever, and I loved that they’re all obsessed with technology, while Emily’s still so clueless she barely knows how to work a cell phone. Nana, as always, had a ton of classic lines, as did all the other seniors, and of course, Jackie, too. The scene in the Red Light District had me in hysterics - I could picture it so clearly! There’s really not a whole lot I can say without giving away too much of the plot, but the mystery was great - I think I suspected just about everyone but the actual killer, and the killer’s motives were a great twist. Seven books in, and I don’t think I’ve figured out the killer in a single one. Maybe it’s because Emily gets so paranoid that she suspects everyone, and I’ve learned to do the same. I love it when she thinks she has it figured out, and then new facts are added - in this case by the seniors, thanks to their tech-savvy ways, which was hilarious - and she has to start all over again. One side benefit to these books is that I get to travel the world without actually leaving my house. I love to travel, but haven’t had a chance to do much of it, so I get to see all these places through Emily’s eyes and learn interesting facts about different countries and some of their main attractions, customs, food, etc. It’s all fascinating to me. Cute, laugh-out-loud funny, and action-packed - if you haven’t read this series, you’re really missing out! And the next book will be set in Scotland - yay! I don't think I ever heard of this series before. It sounds really intriguing. I love to travel too but I haven't actually went many places so I might really enjoy this! Lovely review Marie!